Today we spoke with Victor Martinez, who is the export manager for the Frucosol Company that is based in the city of Calahorra in Spain. Frucosol has long been known – especially in the European market – for their commercial citrus juicers. We asked Victor about their GF-1000 Glass Froster, which is designed to use liquid CO2 to freeze and frost glasses on an as-needed basis. We’ve been selling the froster since it was introduced to the US market in 2013, and we wanted to find out more. Tell me a little about the history of Frucosol and the changes you have seen since you have been there? Frucosol started to manufacture two models of orange juicers in 1991; little by little, and step by step, they got a name in the Spanish National Market, and in 1998 started to sell its products abroad (France, Italy and Portugal). With the passage of time, Frucosol began adding more models of juicers, and we started to manufacture our first model of cutlery polisher. How and why? Just listening our customers and the needs they had. I started to work by Frucosol in 2003, and my first tasks were increasing the National Sales, although one year later, I started to work in the International Department. The main changes I have seen are the increasing of new products (glass polisher, decarbonisers, and glass froster) and the huge increase of our sales in more than 75 countries all over the world. This is possible because of the high quality of our products, and the excellent service we provide with deliveries. Or is it a new idea? We started to manufacture the glass froster in November-December 2012 and we took the idea from one machine one of our customers had talked about it. The problem that machine had was that it was very big, very expensive and the potential customers were not so much, so we took the idea, modified the principle and started to develop a more economic and simple machine. The key point is the liquid CO2 gas that is used in this type of machine. 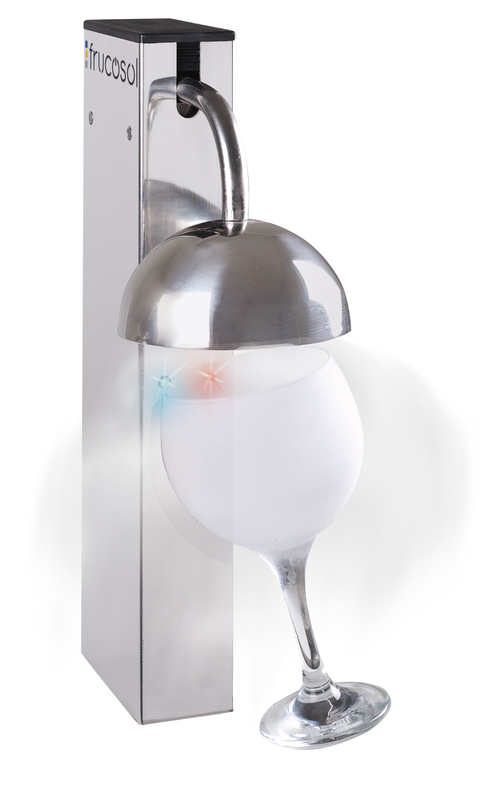 Frusosol introduced the glass froster a couple of years ago. Who are your customers, and how do they use the glass froster? Frucosol sells its products to distributors and dealers of more than 75 countries all over the world, and our dealers are selling the glass frosters to bars, restaurants, hotels, caterings, wine shops, breweries, wine cellars, discos, pubs…even particular people who use it at home. We can say it is our most sold product in the last 2 years. What should a potential customer know before buying the glass froster? First of all they have to get informed if a local gas supplier can supply them the gas the machine needs to work, that is, a CO2 liquid gas cylinder with dip tube. Without it, the machine is not useful at all because it doesn’t work. Once we are sure we can get the gas, we don’t need to worry about anything else. 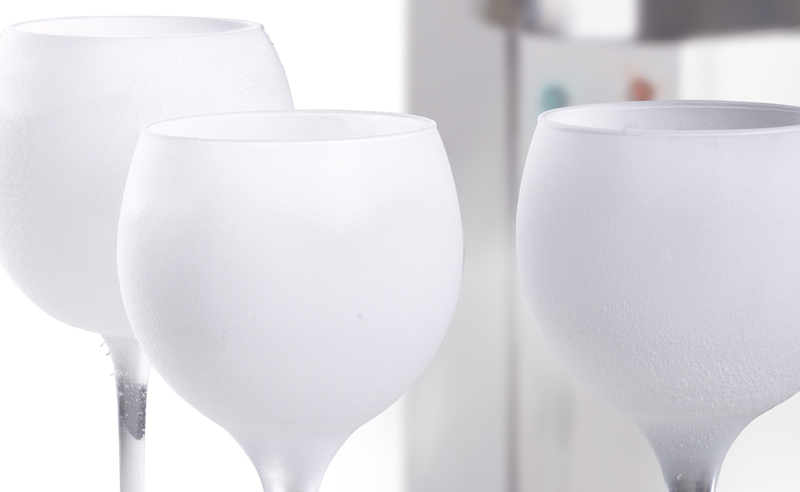 The Glass froster GF1000 is able to freeze any type of glass: wine, champagne, beer Pilsner glasses, cocktails. This machine will help you to taste much better all your drinks. What is the feedback on it from customers – what do they like and not like about it? Can you tell us about any new products that are coming out soon? Our I+D Department is always working in new products. Take into account that Frucosol started to manufacture only 2 models of juicers, and now you can see our great range of different machines, so we are always thinking of new machines. At this moment, my partners are working on a new model of glass froster, and we are testing a new cooking machine, a machine we are already selling in Spain to test it. When we launch a new product, we prefer to sell it locally for some months in order to check possible failures, as it is easier for us to modify a machine that is near our factory. We present our cooler revolutionary DRINKWARE "Frucosol Gf-1000 " . This novel device cools and sterilizes any cups and glasses in just a few seconds. Improves taste of beverages by avoiding quue the ice melt in the drink. This machine is ideal for cooling the tops of champagnes and white wines, because the cold glass keeps the carbon of these drinks. This appliance is recommended for Hotels, Bars, Restaurants, Clubs, Lounge or Cocktail Bar. If you have one in your establishment will make your customers perceive quality in service that will differentiate itself from its competitors.